FreedomPop's Global 3-in-1 SIM gives you free voice, text, and data in the US (and 25 other counties). 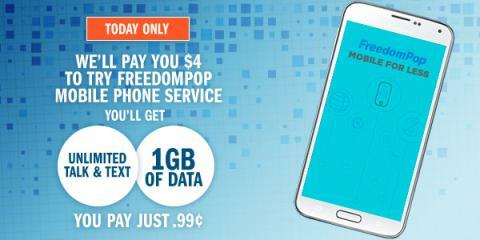 Buy the $0.99 SIM card, get your first month of FreedomPop for fee, and earn 400 SB. If you stay subscribed for 3 months, you'll get an additional 1000 SB! Get yours by using this link before Wednesday, September 28th! It's a zero-risk offer that pays you to try out a new, less expensive way to use your mobile phone. This is a great way to do it, and when you sign up through the link above and get your 400 SB, you'll get a bonus 300 SB at the beginning of October. So that's $4 for trying Bluehost, which gets you 700 total SB, which you can turn into $7 worth of gift cards!